The "CO2 Recorder TR-76Ui" is manufactured by T & D Corporation. 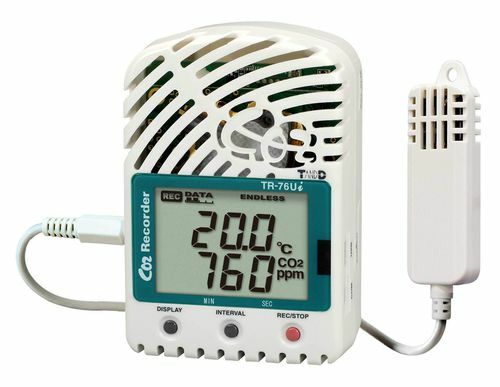 It is a three-channel data logger designed to simultaneously measure and record CO2 concentration, temperature and humidity. The product is an all-in-one package that includes the data logger unit, sensors and software. Its logging Capacity is 8,000 data sets (One data set consists of readings for CO2 concentration, Temperature and Humidity measurements. ), recording interval select ranges from 15 choices: 1, 2, 5, 10, 15, 20, 30 sec. or 1, 2, 5, 10, 15, 20, 30, 60 min. and the recording mode	endless (Overwrite oldest data when capacity is full) or One Time (Stop recording when capacity is full). The LCD Display Measurements, Battery Level, have the measurements of CO2 concentration, Temperature or Humidity (fixed or alternating display).